Take a deep breath, and have fun. 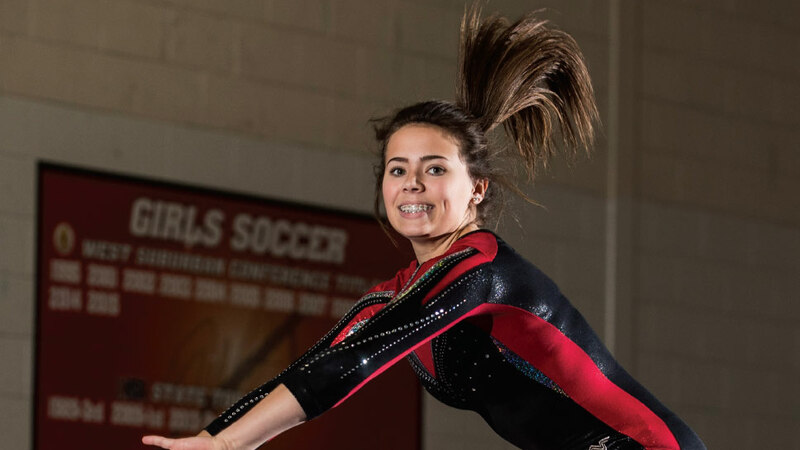 Hinsdale Central High School Senior Lily Jones has taken that approach to every routine since her early days in club gymnastics. Those sage words of wisdom came from her father Dan Jones, who is in his sixth season as Hinsdale Central’s athletic director following seven as athletic director at DeKalb High School. Lily’s final season of competitive gymnastics has been joyous yet bittersweet. The all-arounder has seven senior and four four-year varsity teammates. For Dan, this is his final dual season as athletic director and parent following older children Jake, Evan, and Sophie. His wife, Julie, assists other gymnastics parents at meets and even Dan in a pinch, such as a recent Costco run for concessions. Even before becoming DeKalb’s athletic director, Dan taught there for 15 years. He was head football coach for three and an assistant wrestling and track coach. His first year at Hinsdale Central, Dan commuted between DeKalb and Hinsdale, staying with relatives in Downers Grove when needed. “I had never heard of Hinsdale Central,” Lily says. When the family moved to Clarendon Hills in August 2013, Lily no longer could attend Energym in Sycamore. It’s where she began club competition in second grade and achieved Level 4 and 5 state all-around championships in 2010 and 2012. Lily misses the “small-town feel” of DeKalb but today, she’s pure Hinsdale Central. The past two years, she’s been heavily involved with the Red Devil Nation spirit club. She has no shortage of spirit wear courtesy of Dan, whose license plate even includes RED DEVIL. During the 2014-15 school year, Hinsdale Central captured a record eight championships in IHSA-sponsored events. The previous record of six in 1998-99 by St. Charles High School (now St. Charles East) came while Dan coached track. After Lily sat out this season’s first two meets with a back injury, the seniors earned their highest team score (141.65), and the Red Devils finished second at their home invitational. Current teammates Jessica Elliott and junior, Kylie Torsberg, were among Lily’s first friends in eighth grade after moving. They met at the Balance Institute of Gymnastics club. Lily is headed somewhere warm, probably the University of Mississippi or Arkansas, or Belmont University, to become an athletic trainer and physical therapist eventually. “I know I want to be involved with athletics in some way,” Lily says. Dan says he simply enjoys Lily’s meets after watching Jake and Evan wrestle and Sophie play freshman volleyball.